Recombinant versions of Adeno-associated virus emerged as the premier choice for gene therapy due to beneficial characteristics of transduction, immunogenicity and safety. So far, two drugs based on wild-type AAV serotypes 1 and 2 (Glybera, Luxturna) have been approved as replacement therapy for monogenetic diseases. Unfortunately, current production strategies are inefficient and/or difficult to scale and available wild-type tropisms might not allow for the targeting of desired cell types. We analyzed and rationally engineered the rAAV capsid for targeting, purification and detection and the rAAV genome for easy modification and rapid prototyping. The use of our constructs is demonstrated with a tumor-cell specific suicide gene therapy also named virus-directed enzyme prodrug therapy (VDEPT). Specifically, we used a DARPin N-terminally fused to the capsid protein or peptides fused in a capsid loop structure to target epidermal growth factor receptor (EGFR) overexpressing cells. Specificity was demonstrated with a set of cells expressing a range of EGFR densities. As gene of interest, a fluorescent protein enabled microscopy and flow cytometry, and thymidine kinase or cytosin deaminase were used to activate prodrugs. In addition, we evaluated HEK293 suspension culture conditions for rAAV production in a fermenter and tested the stable integration of helper genes. Viral particles were purified by ultracentrifugation and analyzed by qPCR, electron microscopy and atomic force microscopy. rAAV may also serve as a scaffold for vaccination. 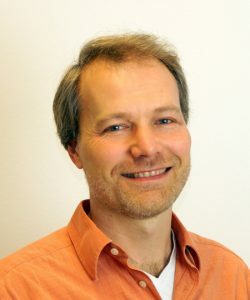 Kristian Müller is a professor of cellular and molecular biotechnology at Bielefeld University, Germany. He was an assistant professor and group leader at the University of Freiburg and the University of Potsdam. Prior to his independent career, he worked as a postdoctoral scientist at the University of California at Berkeley, and he received his Ph.D. from the University of Zurich and his Diploma in Biochemistry from the University of Hannover. Within the realm of protein engineering and synthetic biology he performs basic research and develops technology, which he utilizes to drive innovations such as cancer biotherapeutics. Publications: Researchgate, Google Scholar, ORCID.